Do you love reading Self Help\Motivational books?? Do you find them helpful? I am very choosy in reading such Inspirational books since after a certain point, most of the books started to sound same for me! The book I am sharing today is a Self Help book for Mind, Body, Soul and Spirit..
Life is full of uncertainties & surprises and we have to make sure that we just don't get thrown out of balance in facing such situations. As the author said " People who are truly successful at this game accept the uncertainty and are equipped to deal with whatever life throws at them". It is divided into 20 chapters and each chapter covers a different topic\aspect of life, including various sub headings. If something in particular interests you, then you can easily go to that chapter directly. Basically, it is a book for improving your overall lifestyle and state of mind. There are various interesting topics like 'Stop comparing yourself to others', 'It's never too late to start', 'Live the moment', 'The art of acceptance' and many more..
Life is all about balancing. 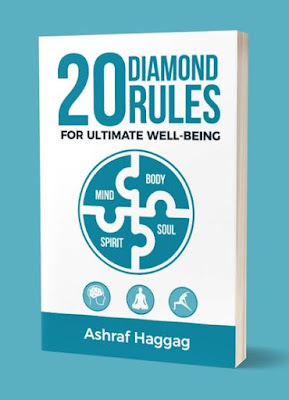 This book stresses equally on emotions, self control, setting goals and priorities in life and also with these not to forget your physical heath. The book talks about how to be careful about the people with whom you spend most of your time with.The type of people we are surrounded by, do impact our mental health. Similarly, communication is not just about exchange of mere information. It is about understanding of emotions and intentions behind the information. The best part of the book is that it is very straight forward & without any long philosophical stories.This makes the book approachable and relatable. Over explanations of things sometimes makes topics boring in such self help book, but in this book everything is crisp and to the point. There are lots of tips and tricks on how to feel better or how to make a situation better. Basically everything is about the Balancing Wheel of Life! I can say this is one of the most practical Self Help book I have come across till now. Would surely like to recommend this one! Till my next post, Happy Reading! Know About Onion Hair Oil..
Must Have Health Care Products in HandBag!